Associated Hebrew Schools approached Intrigue with a fairly straight forward request. Complete redesign, search engine optimization, and a complete content management solution. Intrigue understood the exact requirements and presented three design mockups. Once AHS had chosen the design, Intrigue integrated to artistic design into a feature rich content management solution with minimal additional custom work. 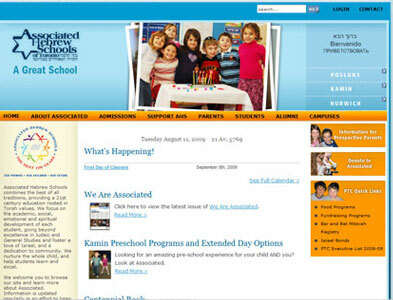 This project was a success from the get go, and AHS now have a great website to represent their organization.